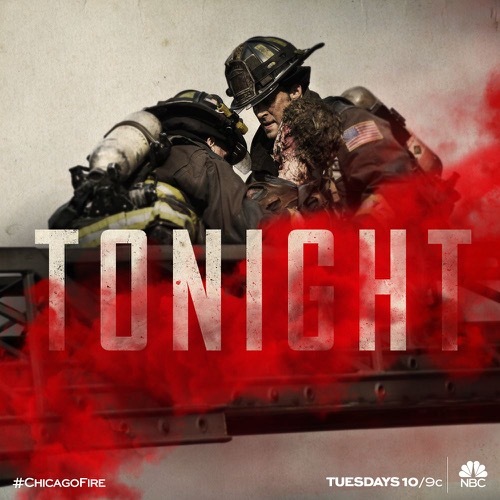 Tonight on NBC Chicago Fire returns with an all new Tuesday, November 15, season 5 episode 5 called, “I Held Her Hand” and we have your weekly recap below. Tonight’s Chicago Fire season 5 episode 5 looks like it is going to be great and you won’t want to miss it. So make sure to bookmark this spot and come back between 10PM – 11PM for our Chicago Fire recap. While you’re waiting for our recap make sure to check out all our Chicago Fire recaps, news, spoilers & more, right here! Chicago Fire begins with Christopher Herrmann (David Eigenberg) playfully bugs Stella Kidd (Miranda Rae Mayo) that she stole his parking spot, before she can say anything, Herrmann is upset that someone put graffiti on their firehouse. Joe Cruz (Joe Minoso) and Brian “Otis” Zvenecek (Yuri Sardarov) says that nothing is going to ruin their two-week high. Chief Boden and Lt. Matt Casey (Jesse Spencer) tell them to grab the turpentine and clean it up; but is interrupted by the alarms. The crews arrive to a building on fire, where they are told a woman is stuck somewhere on the second floor. They find the husband, who is refusing to leave his wife behind. Lt. Kelly Severide (Taylor Kinney) manages to bring the husband out, and tells him he needs to let them do their job. Casey climbs the ladder and is able to hold her hand. Mouch and Casey bash in the window, but the woman is badly burned. While the husband watches helplessly by, the wife has no pulse and they cannot get her intubated. Severide and Casey are both visibly shaken. As they investigate the building, Herrmann asks Casey if he is okay, and he responds that he has seen this before. Boden sees Casey crying and tells him to take a few minutes outside, Casey refuses. Casey notices something on the floor. While the crews are outside cleaning up the graffiti, Mouch races to find Brett when he gets a call from his wife’s publisher friend, Antoine. They accept an offer of $25,000 for all rights to the novel, but they are so excited about the offer, they forget a copy of the manuscript in the copy machine. As the fire crews are finished cleaning the walls, a woman approaches the firehouse and tells them she is Colleen Marks, the sister of Kara, the one who died in the fire today. Casey offers their condolences, and comforts Colleen by telling her that her sister’s death was immediate and not painful. Colleen asks if there was anything suspicious about the fire, because Kara and her husband fought all the time. Kara admitted she was afraid of him, and had only gone back for her stuff. Colleen tells them that Kara’s husband killed her. Casey confirms later to Gabi Dawson (Monica Raymund) that he believes the fire was arson, and he flagged it. Herrmann sees Brett and Mouch laughing and hugging each other, and when they notice him they slink away, leaving him suspicious. Meanwhile, Boden leaves a message for his ex-wife’s son, James (Jimmy) to get in touch with him and he would love to talk; his call is interrupted by Herrmann. Herrmann sits with Boden, and they share stories about their boys growing up. Herrmann informs Boden that some of the truckers are going to stay up and see if they can catch the person “tagger” who is writing on their walls. Herrmann is the only one taking it seriously, saying the graffiti is like giving the whole firehouse the finger. Boden introduces the fire investigator to Casey and Severide to talk to them about the suspicious burn pattern they saw. Casey says there was a char line going directly to the bedroom, there was no way of exiting or entering. He also says that Kara’s sister came by the firehouse with her suspicions. The investigator informs them that the husband said he was out for breakfast at the time the fire broke out, and his alibi doesn’t check out. When Severide was asked about the husband, he admits he doesn’t think the guy did it. He was distraught and was willing to die to save his wife. Gabi and Brett are called to an accident where a man had fallen from a tree. Alan is able to move his fingers and toes, complaining only about his stomach. Brett sees a prom sign, that he was putting in the tree when he fell. Gabi yells at the bystanders laughing and recording the incident that he has suffered enough. As they are about to transport him, he rips his head band off and vomits blood everywhere. Gabi says he has a G.I. bleed, and they got to go! Gabi and Brett get Alan into the ambulance, and before they can leave his mother arrives and starts yelling at the husband that it is his fault for putting him up to this. Brett tells her they are taking him to Chicago Med, that he may have punctured his bowel. Back at Firehouse 51, Boden comes out and wakes up Herrmann who is still waiting outside to catch the tagger. Boden’s wife, Donna comes by with their little boy. He thanks her for coming by because he needed this. Connie informs Severide that there is a call for him from Darren, the husband. Severide tells her to give him his cell number. Casey is concerned about it. At Chicago Med a nurse is giving a teenaged girl a hard time about going to see Alan. Brett arrives and realizes she is Heather, the one Alan was trying to ask to prom. Brett brings her to see him, and tells him it was amazing and memorable. Brett is smiling until she hears that Heather agreed to go with someone else. Casey and Gabi are at home, and she is giggling about the cute pictures of Louie. Casey says he is going to Kara’s funeral the next day to pay his respects. Severide meets with Darren, who blames Severide after Severide says it isn’t his fault. Darren says everything is crazy, talking to fire investigators. He tells Severide he was out for breakfast when the fire started; Severide asks him where? He tells Severide where and he paid in cash because the credit card machine was down. He offers his condolences. Casey attends the funeral from his truck, noticing the husband isn’t even grieving or crying. When the truck crew arrives, they see new graffiti on the walls, Herrmann is fuming. Severide asks Gabi since she worked fire investigations before, would they have looked at the cameras on the block where the husband claimed to have been at the time of the fire? Gabi says probably not, if there was no formal request. Brett is upset that Alan’s video has over a million hits on the “Prom Fail” website. Boden gives Herrmann his phone to respond to James’ text. Casey is determined to prove that the fire was arson, even showing pictures to Gabi, that imply the fire started in the garbage can. Gabi tells him Severide is trying to get proof that the husband’s alibi checks out. Gabi is concerned Casey is looking for proof when there might not be any. He tells her, “I held her hand until her skin turned black!” Gabi says Casey is too close to this investigation. He then tells her the char line was meant to trap her, and he saw it. Brett and Mouch are called into Boden’s office, where they find out their manuscript has been discovered. They are told that the novel makes the department look bad, Mouch tells him they have a book deal, and they are told if they publish the book, they will never work for the Chicago Fire Department again. They are excused when they receive another call. The firetrucks arrive on scene but the ambulance is stuck behind a train. Casey arrives on rooftop to find that one of the bus-boys, Tim has been speared by an umbrella after a gust of wind sent it air born. They saw the umbrella off him, but he is bleeding excessively and the ambulance won’t be there any time soon. Stella can’t even get a pulse on the one side. Casey tells them they need to tighten the leg to cut the bleeding. Ambulance finally arrives, Casey is worried he won’t make it, but Gabi says he should be okay. On the way back to the firehouse, Herrmann catches the tagger in the midst of spray painting another wall. He tells them to stop the truck, and Herrmann chases the kid down. They bring Carlos to the station to see Chief Boden. When Carlos asks how Herrmann knows his name, he tells him it’s on the inside tag of his shirt. Boden asks about his mother and he says he lives with his aunt. He gives him a pen and paper and tells him he wants her name and address. Boden gives it to Connie and demands to know why he would mess with his firehouse. Herrmann guesses he was doing this to impress his friends. Boden tells Carlos that he has seen too many kids from this area end up in gangs and drugs. Carlos has no interest in what he has to say, and when Herrmann walks him out to his Aunt, he tells him that now would be a good time to apologize. Carlos just gives him a dirty look. Herrmann leaves and comes back telling him that he may find it a joke, but the firehouse is like a church to the firefighters and it is sacred to them. They are there to protect and keep the neighborhood safe. Herrmann gives him a firefighters’ sweater and tells him to wear it around his friends to teach them that they aren’t the only friends he has in the neighborhood. Stella calls Herrmann a big softy, but he admits that if he has the chance to do something good, he is taking the chance. Brett decides to do the same thing. She goes with Alan to the prom, where Heather gets extremely jealous. Mouch comes home to Trudy, and although he is depressed that no one can read his book, but she brings him into their living room where all their friends are. Trudy calls it a “Book Club”, where they can read his books; everyone enjoys it. Boden comes home, and Donna comes rushing out the door to tell him that someone has been parked outside watching their house for the past few hours. Boden hands her his bag and tells her to go inside. He approaches the car demanding to know who it is. The man exits the car and it is James. He says when he got the text, he wanted to do one thing better, and came to see him. They hug and Boden yells from across the street that it is James; Donna welcomes him in. Severide is at Molly’s with Herrmann, while Casey sits in the corner and Gabi approaches him and tells him there will be no investigation or murder charges. Severide pipes up and admits that he found cameras to prove Darren was where he said he was. Casey won’t accept it, and truly believes Darren killed his wife, Kara and promises to prove it. He walks out of Molly’s.